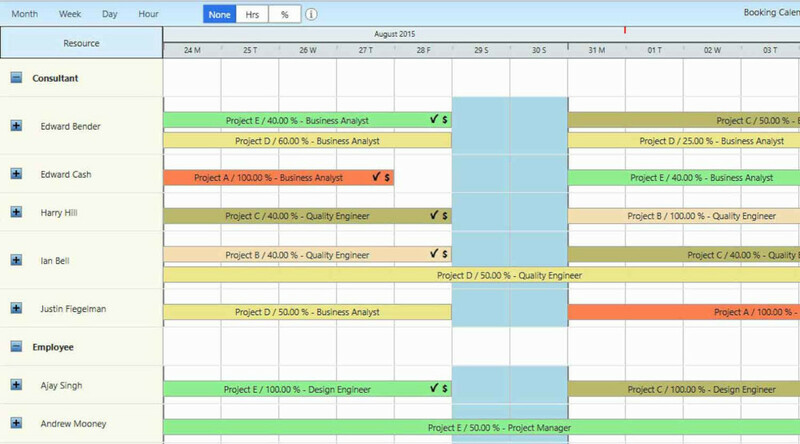 Resource management software with easy to understand Gantt chart view that provides bird’s eye view of resource schedules along with their availability and utilization. 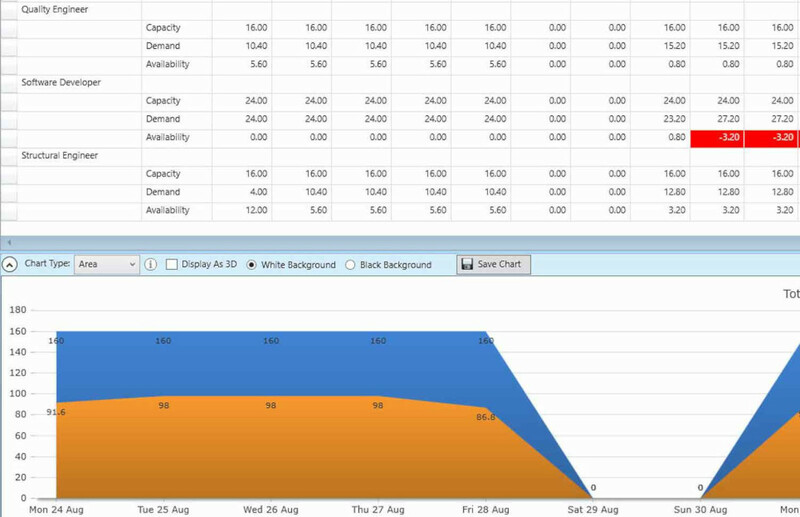 Booking chart has powerful filters that facilitates identifying right resources that are qualified as well as available. 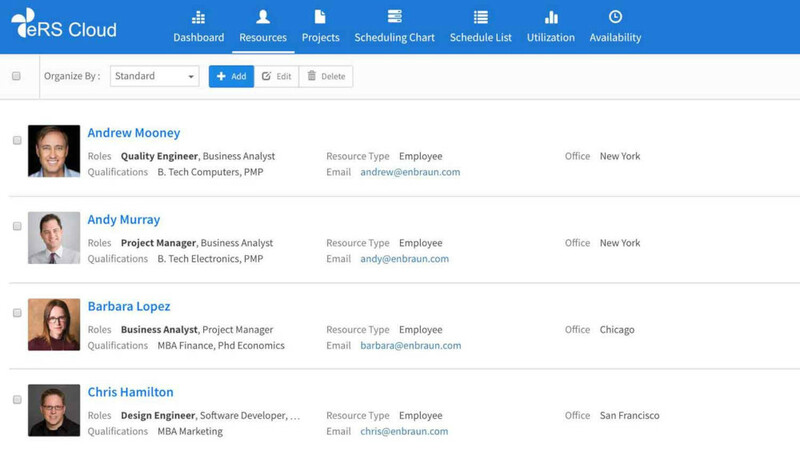 Once identified, resources can be scheduled using drag n drop that makes resource management a breeze. Utilization report is a 2 in 1 report that provides resource utilization and availability data at different levels (organization, resource, team, office, project etc.). It helps identify under & over utilized resources across organization and facilitates optimizing resource utilization at every level. On-Premise version of our resource management software has complete timesheet feature that allows capturing actual time spent by resources on different projects. 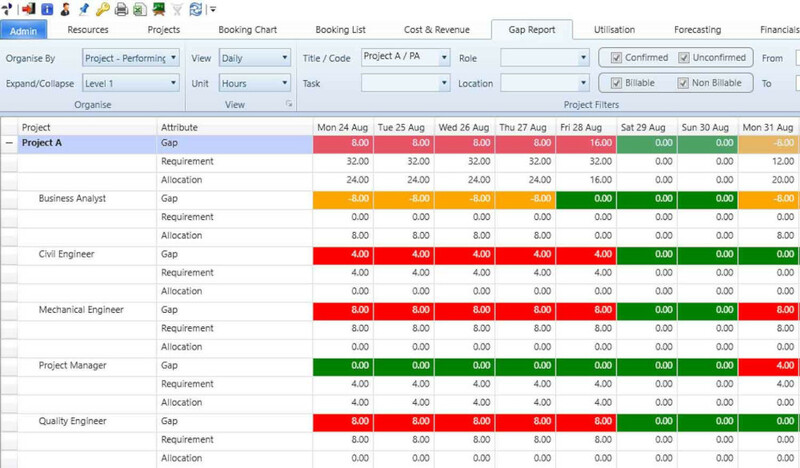 Timesheets also facilitate reporting on planned vs actuals utilization, availability as well as on actual cost, revenue and profit at resource and project level. 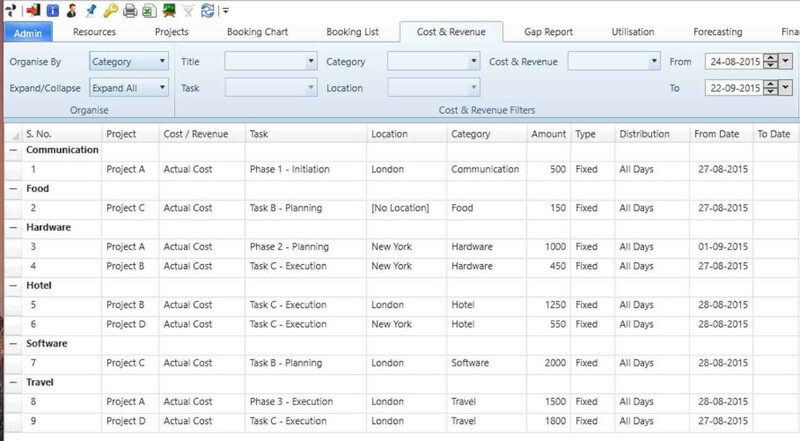 On-Premise version has cost and revenue screen that allows users to add project cost / expense and revenue against different custom defined categories. This information is included in financial reports to provide complete picture of project financials. On-Premise version has financial reports that accurately calculate financial aspect of scheduling resources on different projects and its impact on organization’s bottom line. It reports on planned & actual resource cost, revenue and profit at organizational, project and other levels. 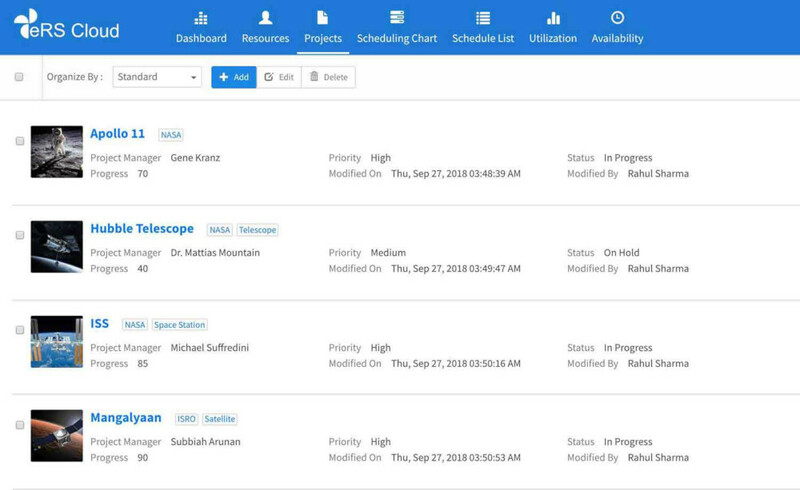 In On-Premise version resource management tool users can define and submit what type of resources are required for projects along with required role, effort and dates. This information is available at the time of scheduling resources and helps in identifying and scheduling qualified resources on projects. 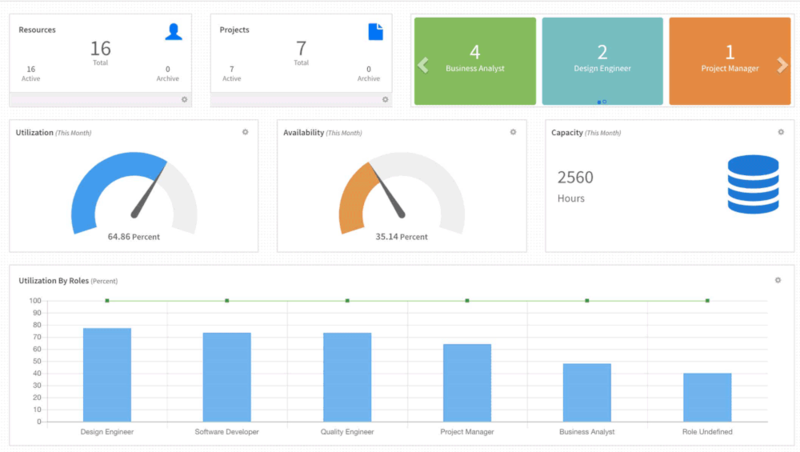 Gap report in On-Premise version compares number and type of resources required on projects and shows a detailed side by side comparison. Gap report highlights resource shortages and excess at different levels within a project and helps in ensuring that project is adequately staffed at all times. On-Premise version has Forecasting report,it is a high level report that compares resource capacity vs demand and highlights when and where resource shortage or excess will occur. With the help of information provided in forecasting report, organizations prepare accurate hiring plans to ensure that resources with right skills are staffed and available according to short, medium and long term project requirements. Information of all resources across the organization is managed from a single centralized resource screen (accessible according to user access rights). 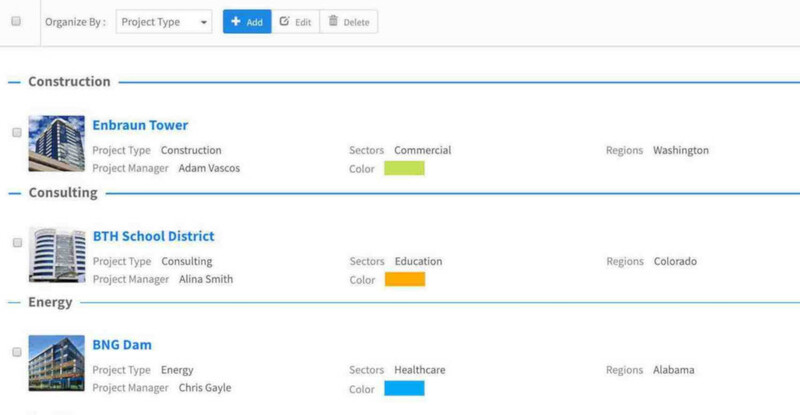 Administrators can define custom attributes to capture all required information such as Skills, Education, Experience etc.This facilitates accurate resource profiling which leads to easy identification and scheduling of right resources on projects. 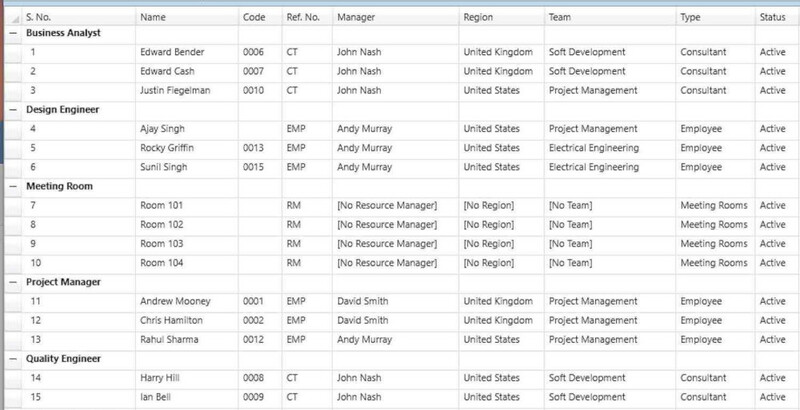 Project Screen of our resource management software lists all projects on one screen (accessible according to user access rights) and allows adding / importing more projects in the system. 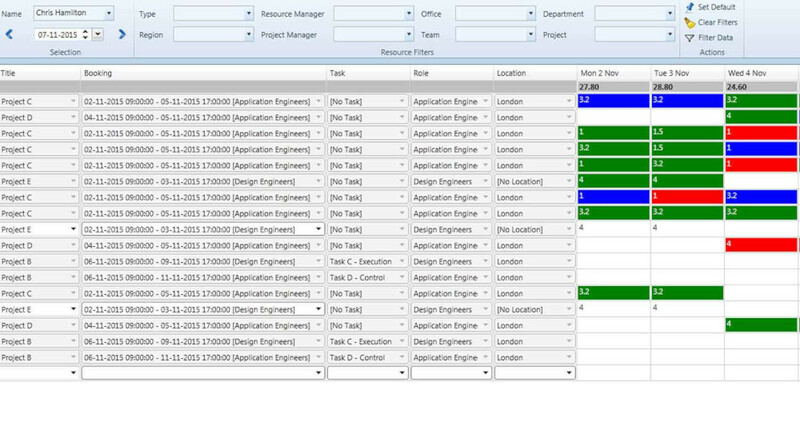 Users can capture all project information using basic & configurable fields. Project tasks can be added manually or can be imported from MS Project file, this helps in scheduling resources at task level and also in organizing scheduling data and reports by Project – Task. Organizations spend lot of time, effort and money in hiring qualified resources, but hiring good resources is just one part, efficiently utilizing them is another!That’s where a good resource management software proves vital . eRS Cloud is designed to help organizations utilize resources efficiently by properly profiling, identifying and scheduling qualified resource on projects and ad-hoc work.It has mature features that are developed based on industry feedback which ensures that organizations get the best out of their resources; hence getting more done with fewer hands. Our users have reported completing 15% - 25% more projects just by efficiently resourcing them using our resource management software. Correct Information is the key to effective resource management and decision making. 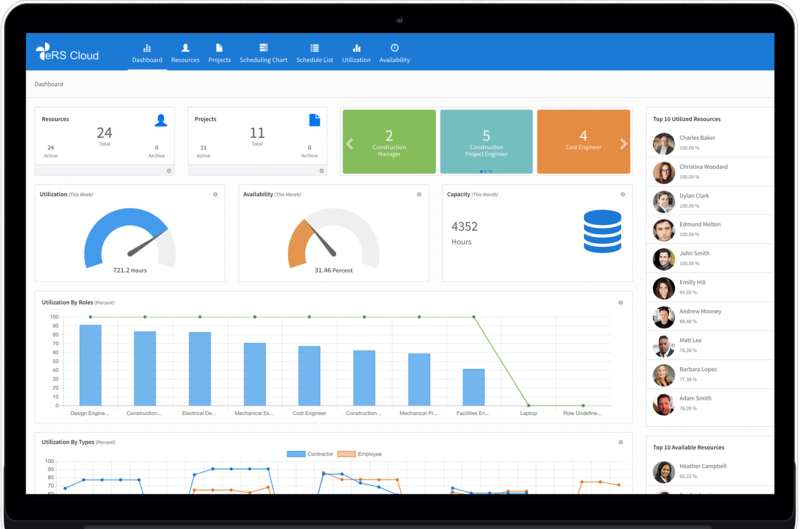 eRS Cloud resource management software, has a highly configurable and easy to use dashboard that allows key information accessible on one single screen. These widgets can show information in multiple units and scale as per your requirement. Dashboards provide a real time insight into resource capacity, resource utilization, availability, projects etc. and instantly highlights areas which require attention. On the basis of this information, user can drill down to get detailed insights. Organizations that have multiple offices, have resources spread in different locations, cities & even countries.Further these resources maybe grouped under multiple teams, departments and be working on different projects.This leads to a lack of visibility of your organization’s resources and diminishes ability to efficiently identify qualified resources when required. eRS Cloud resource management tool, maintains a centralized directory of all your resources along with all possible information (skills, qualifications, certificates etc.). This information is shared with restricted users across the organization based on their access rights. Having a centralized directory, makes searching & identifying the right resource across multiple offices, geographies, teams very easy. Organization might undertake multiple projects of different types at any given time. Projects might be in various stages and this information is often spread across teams and departments responsible for individual projects. This makes reporting about projects and resources ineffective and often incorrect. eRS Cloud maintains complete list of all your projects in one place. 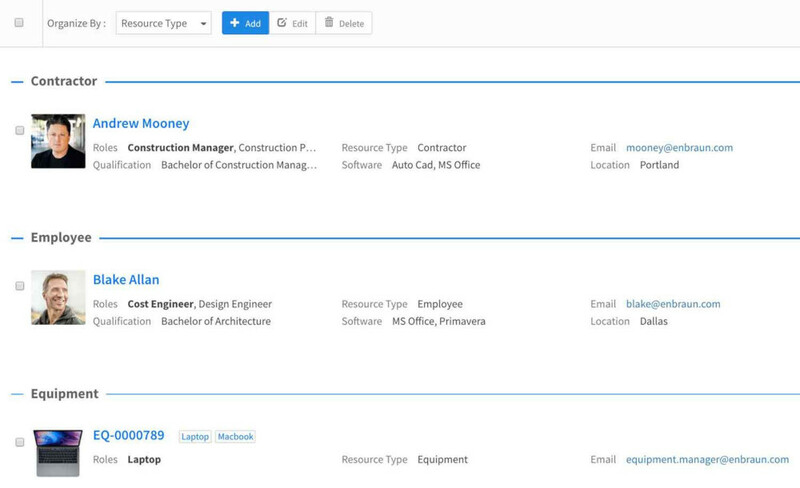 Project profile forms and custom fields allow capturing all possible information that can later be used to filter and identify projects quickly. Centralized project list is shared with all users across the organization based on their access rights, so users have access to project information on need to know basis. Having a centralized list of projects provides accurate and clear visibility of projects and their statuses based on which organization can make key decisions. Organizations constantly want to optimize resource utilization, but it’s difficult to improve what we cannot accurately measure. Thus, resource utilization needs to be accurately measured and reported. eRS Cloud uses algorithms that measure and report on resource utilization at all levels (resource, project, team, office etc.). 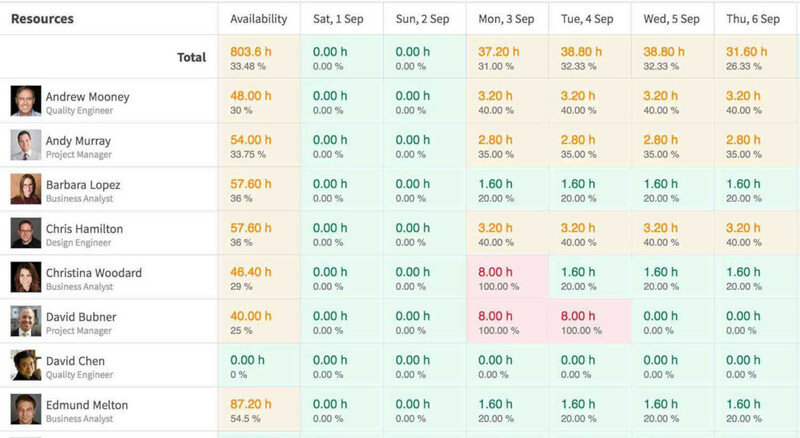 This information is updated in real-time whenever a booking is created, deleted or updated. 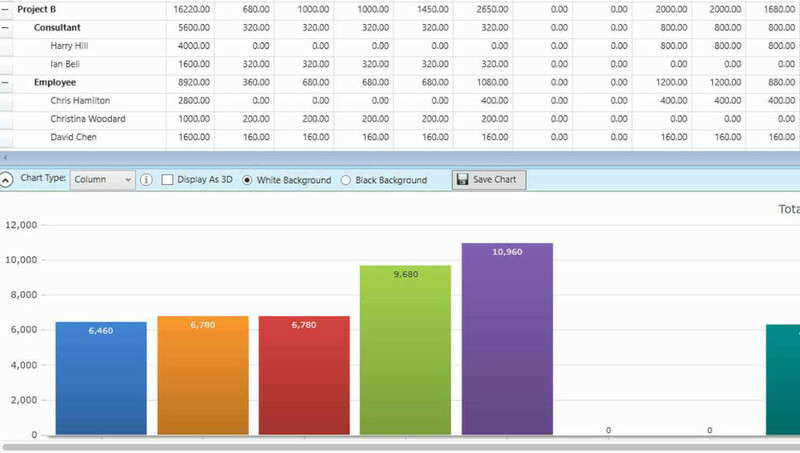 Utilization reports are highly configurable (views, units, graphs, filters etc.) and provide information required for management decision making and hence optimizing resource utilization effectively. Information about availability of resources is important to take critical decisions regarding initiation of new projects and to make effective hiring plans. This information is often buried in spread sheets, notebooks of various teams members and managers. 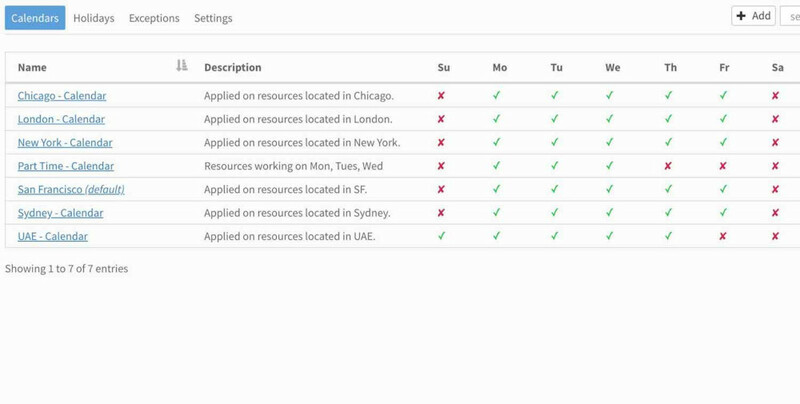 Our availability report shows accurate and integrated availability data at all levels of organizations (resource team, office etc. ); that too in multiple units and views. Report gets updated in real-time whenever a booking is created, deleted or updated. This facilitates making efficient resourcing and hiring plans for short, medium and long term. We understand that resource, project, scheduling and reporting data can be confidential. Thus, we have developed the most sophisticated user access rights in the industry. Our user rights ensure that users are only able to view and / or modify data as per rights assigned to them. View and / or edit rights can be assigned at resource level, project level or by any other grouping (manager, team, department, office etc.). Employees, contractors, equipment, meeting rooms etc. all resources are important and need to be managed and scheduled efficiently to ensure organization’s success. eRS Cloud resource management software allows scheduling resources of any type. Every resource type has a profile form for information capturing. 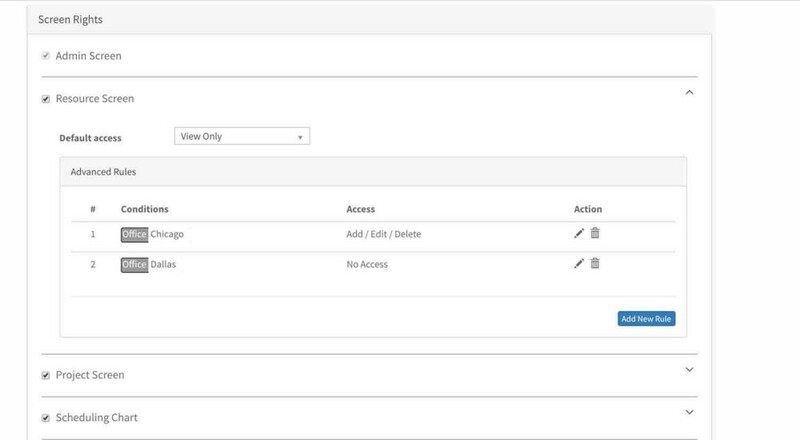 Configurable fields allow capturing information according to requirements of each resource type. Example: Skills for employees and Capacity for meeting rooms. 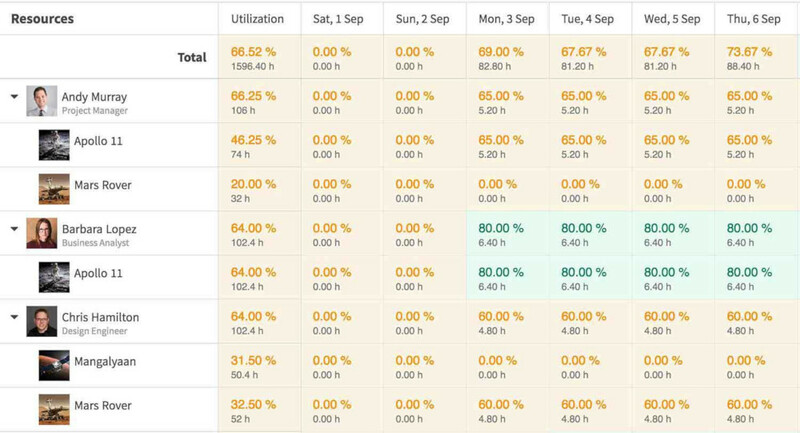 Reports show utilization and availability figures according to resource types and schedule can be configured to show different types of resources scheduled against projects. Not all projects are same. Some can be related to marketing, some engineering, some consulting, some can be small projects and others can be large. Thus, eRS Cloud allows configuring multiple types of projects as per your requirements. 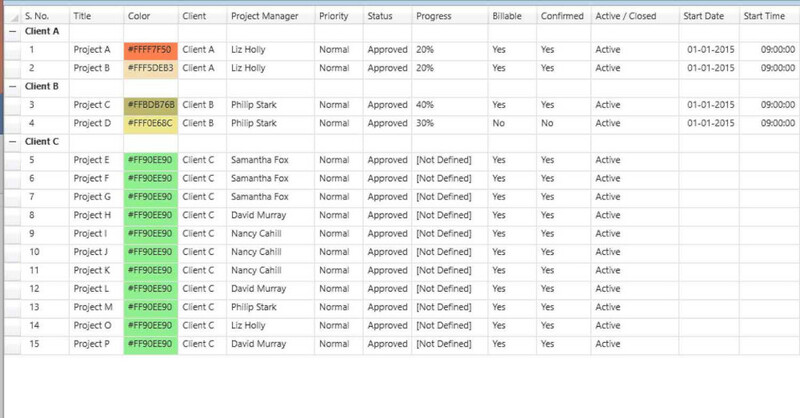 Each project type can have custom information capturing fields. Reporting can be done based on the project types. Example marketing project type, consulting project type and so on. 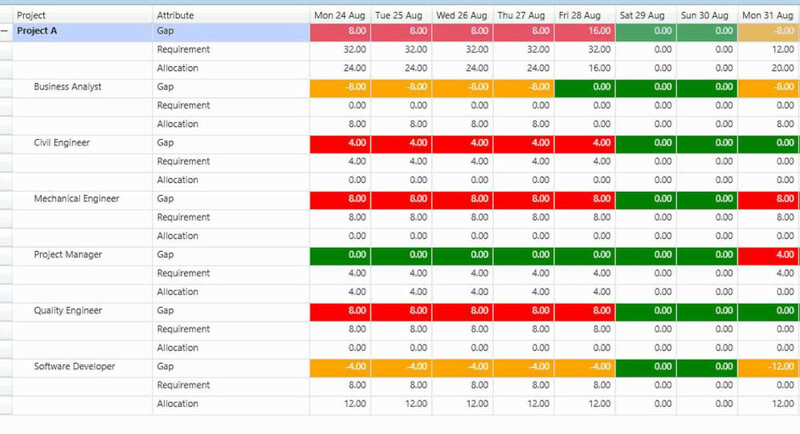 Defining working days, timings and holidays for resources is important for accurate resource scheduling. No matter if you have resources in one city or across the globe, or if you have full time, part time or casual resources - Simply create a working calendar for every unique working pattern in your organization (working days, timings, holidays) and map it to resources. 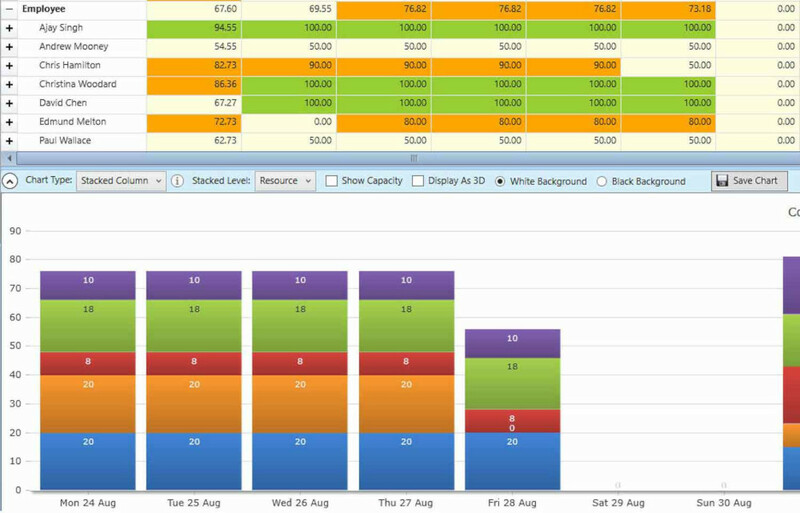 Our software will automatically calculate resource capacity based on resource’s working calendar and will ensure accurate calculations and correct reports. We offer billing and subscription options that we ourselves are comfortable with. Thus, we have provided flexible subscription options with no long-term commitments. You can choose number of resources that you want to schedule (increment of 1) and opt from monthly or annual billing plans. You can choose to increase or decrease number of resources on the fly and our billing system will automatically charge / provide credits for balance amount on pro-rata basis. Reducing number of resources will result in credits, that will be used against future invoices. Q. Are on-premise version and cloud version part of same software? No, on-premise version and cloud version are two separate software. Cloud version is offered as Saas product and on-premise version is offered as licensed product. Q. Different terminology is being used to describe software, why? Our two software are ‘eResource Scheduler Cloud’ and ‘eResource Scheduler On-Premise’. These are both resource scheduling software but are also referred as resource management software, resource planning software and resource allocation software.